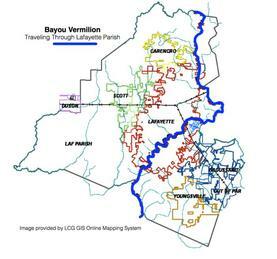 The Lafayette Garden Club will promote Bayou Vermilion awareness through participation in Bayou Vermilion Festival, League of Women's Voters Forum on Water Issues, Trash Bash, Earth Day, Bayou Vermilion Day, and with school visits. to the bayou and the watershed. Wednesday, Feb. 20, 12:00 noon - 1:00 p.m.
A complementary light lunch will be served beginning at 11:30 a.m.
will be among the topics. first time in many yearsThe newly formed Bayou Vermilion Preservation Association and the Bayou Vermilion District joined forces to encourage people to come to the Bayou on October 21st. Take an upclose and personal look. Bayou Vermilion District's Bayou Vermilion Festival & inaugural Boat Parade. and live music by Goldman Thibodeaux & The Lawtell Playboys and more. and children 6 and under enter free. for canoes and kayaks for those wishing to participate but don't own a water craft. recreation for the citizens of Lafayette Parish. you can visit BayouVermilion.org/BayouFest or call (337) 233-4077.